Cardiac electrophysiologists at Southcoast Health perform surgery to insert many different kinds of cardiac devices. These include pacemakers, Implantable Cardioverter Defibrillators (ICD) and Biventricular Implantable Cardioverter Defibrillators (BIV ICD). These devices can help patients with slow heartbeat, in prevention and treatment of cardiac arrest and to help patients with congestive heart failure. 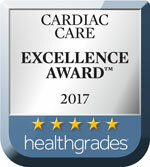 Southcoast Health has been in the forefront of implanting MRI compatible cardiac devices. Previously, patients with such devices could not receive a MRI, but with the latest technology and expertise of implanting doctors at Southcoast, now patients are not limited in getting MRIs if they have one of such devices implanted. Do I Need a Heart Device? These devices are useful in patients with bradycardia (slower than normal heartbeat) or heart block (a blockage in your heart’s electrical pathway). Some patients with atrial fibrillation and alternating slow and fast heartbeats also benefit from pacemakers. These devices are useful in patients with weak hearts (cardiomyopathy) to prevent and treat potentially life-threatening rhythms like ventricular tachycardia or fibrillation, which can lead to cardiac arrest and death. Patients with weak hearts either due to previous blockages in heart arteries or other reasons called non-ischemic cardiomyopathy are typically at higher risk of cardiac arrest and benefit from these devices. These are specialized devices that are useful in treating symptoms of congestive heart failure in patients with weak hearts. Patients with weak heart (cardiomyopathy) and problem with their electrical cables like left bundle branch block (LBBB) can benefit tremendously from these devices. They have been shown to decrease hospitalizations related to heart failure and also death from heart failure in long-term follow-up. 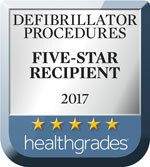 Southcoast Health was one of the earliest centers in New England to implant a cardiac defibrillator with the wires outside the body and under the skin. In some patients, this can reduce risk of infection and has other potential benefits. Ask your doctor if you are a candidate for this device. Sometimes, doctors use temporary pacemakers for emergency situations, such as right after a heart attack, but these pacemakers are frequently temporary and do not require surgery. Cardiac devices have two main parts: wires connected to electrodes on your heart and the small internal pulse generator. Using an X-ray, your electrophysiologist will thread the wires through a vein to your heart and connect them. The electrodes are in constant contact with your heart. For most adults, the pulse generator is implanted just underneath the skin. This heart procedure usually takes about an hour, and you might spend the night in the hospital to ensure that your device is working correctly. During your recovery, you’ll need plenty of rest, but most people return to work and normal activities with some restrictions in a week. It is important to avoid strenuous activities and heavy lifting for six weeks. After your cardiac device procedure, you will have several follow-up visits with your doctor. We can also talk to you about ways to keep your heart healthy for years to come. Find an electrophysiologist near you today to get started. 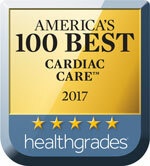 Southcoast Health offers heart care, including cardiac device surgery, in Fall River and New Bedford, MA.